So, that was it. I put down those heavy-duty goodfornothings, and marched right into the kitchen like a soldier about to be sent on a recon mission beyond enemy lines. You think I am exaggerating? Try walking into a street shop in Berhampur to buy rice. They will have four different kinds, all looking exactly the same, ranging from 35 rupees to 120 rupees, and they won’t even bat an eyelid before shooting up the price to 140 if they see you wearing a T-shirt that says “Books turn muggles into wizards – the Harry Potter Alliance”. No degree from well-known institutes of management in western India can come to your rescue, then. Trust me, none. “There’s a 500 rupee note inside the old pencil box on the dining table, and you can find the jute bag folded on top of the used gas cylinder outside,” said the General, pointing towards the door. I waited for a while more, knowing full well that more orders were still to come. That freaking hurt. Real bad. I was OK till the Pillsbury jab, but now I had to find the bag no matter what. “Here. It is right here in front of your eyes.” She dangled the bag in front of me. I will swear on the same mother’s name, I had no clue where she pulled that from. And yet, it was right there, hanging from her arm. General 1, Pillsbury 0. In moments like these, it is best just to go out as fast as you can and so, I did, careful to draw the curtains shut behind me as I closed the door. My God! The glare. It hit me even before I could step into the street properly. It was just too much. There was no way I could take my eyes off the pavement – the sun was just too bright. Should have gotten those shades. I could see my shadow under me – shrivelled to a spot, much like my self-esteem at that moment. I looked at it for a while for some encouragement. Sigh. Let’s go. It’s only about a hundred meters away. We can manage. I nodded, and we started off. Wait a minute, though. Here I must tell you that in Golapalli Street (which translates to “street of the cowherds”), a hundred meters means you will bump into some ten thousand things before you reach the ribbon at the end. Our street is not lined with apartment complexes or housing societies – we have solitary houses, most of them single-storied, with grilled doors instead of solid ones. This means, the moment you are out on the street, everyone in every house knows you are on that street. And still, no one would care to do anything about the stuff they have left on the street that might block your way: a long line of utensils right in the middle of the road, waiting in queue for their turn at the public pipeline, which runs only for two hours in the day; a series of bicycles, each kept aligned in a different direction, depending on how the cows had been sleeping on the road when the bicycle was parked; the endless polka dot collage of listlessly littered cow dung; and of course, the holy cows themselves. And if your day is particularly bad as it was for me, you also get the full blast of marble dust from the end of a rented exhaust fan sticking out of your neighbour’s backdoor (which happens to open to the main street and not the backstreet). Today, however, the cacophony was more civilised. The voices had a touch of glee in them – they almost sounded happy. That would be a first here. I strained my ears to listen better. 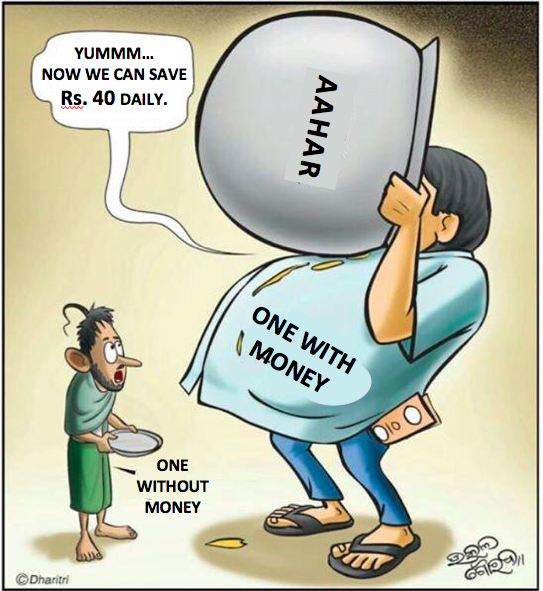 What is this Aahar Yojana? Is the government giving away meals for just five rupees? And three takeaway parcels too? Before I could even bend my mind around it, I saw two little girls and a not-so-little boy, all dressed worse than I had ever seen them before, run in to the streets looking really happy about something. Their faces looked exactly like the little kid’s who had stolen half of a chocolate bar that I was offering to one of my imaginary friends one day when I was nearly six years old. I can never forget that look – that sneaky little devil. And these kids had that exact same vindictive grin on their faces. “Did you come out together or separately?” asked her mother. It was clear that she had forgotten to give this last bit of instruction to the kids. She looked at the son, the eldest of the lot. As I moved past their three-storied house, I looked at the bronze plaque on their door. It read, “S.B. Panigrahi, B.A., M.A., M.Phil. (Sociology), Lecturer (Sociology).” A lot of heads turned my way as I laughed out loud, put the jute bag under my left armpit and proceeded towards the street shop to get my 140 rupees rice. As per the scheme, the urban poor would be provided bhata (rice) and dalma (an Odia dish of lentils with some vegetables) at INR 5 everyday between 11 AM to 3 PM. Although the actual cost of each meal would be somewhere close to INR 20, the Odisha government has received sponsorship from several industrial corporations, which subsidises the extra INR 15. A big populist move though this is and I don’t even want to get into the longrun economics of this scheme, I do hope the genuinely poor can benefit even marginally from this. At least, now people in Berhampur won’t die of eating dry mango seed kernels, hopefully. Update: The Aahar Yojana Centres at Berhampur have stopped giving out takeaway parcels. They learned quick, which is laudable. To keep checking the General vs Pillsbury score, hit the Follow button in the bottom right corner of your screen. If your browser is retarded and the button doesn’t appear there, go hit the menu button in the top right corner and you would know what to do next. I am tempted to bring up a certain eatery in a fairly well-known campus in western India and its discriminatory policies here, but I won’t. I bet no one else could better visualize the details starting from searching for the 500 rs till the door of SB Panigrahi. Throughly enjoyed this one plus many memories flashed while reading this. Thanks, bhai. Let’s meet up sometime if you are free this week.